Connacht welcome Glasgow Warriors to the Sportsground for their Guinness Pro14 opener tomorrow evening. Kieran Keane and Jarrad Butler on the training ground this week. JARRAD BUTLER WILL make his debut when Connacht begin life after Pat Lam this weekend. New head coach Kieran Keane has included 26-year-old Butler in his starting XV for their Guinness Pro14 clash with Glasgow Warriors at the Sportsground [KO 7.35pm, TG4]. The former Australia U20 international back-row forward will play his first competitive game for his new team since signing a three-year contract in the summer after three seasons with the Brumbies. The Connacht team to face Glasgow includes four current Irish internationals — Finlay Bealham, Ultan Dillane, Kieran Marmion and Matt Healy — as well as captain John Muldoon, who leads the side in his 15th season with the province. Email “Keane includes Aussie debutant in his first starting XV as Connacht boss”. 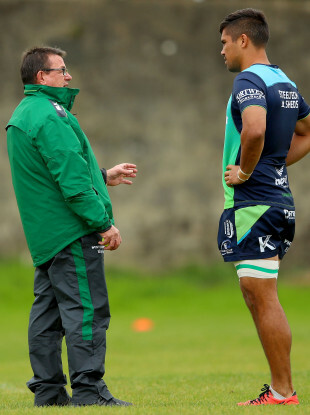 Feedback on “Keane includes Aussie debutant in his first starting XV as Connacht boss”.